About Me. Ha ha, so how much can I give away and still leave with a degree of dignity. Where do I start. Well to begin with. One of my school reports had the following statement, this was in religious education! “Lee has faith but charity is needed when marking his work” This quote pretty much sums up my childhood education experience. From the age of 16, I entered the print trade and after passing my three year apprenticeship in reprographics and origination, I went onto creating artwork for many different applications including magazines, packaging, labels and commercial print. This industry gave me was an eye for detail and more importantly an eye for what is commercially required. “What Looks Good” I believe my images and reputation are my qualifications, I have always been humble with my talent, because I believe the moment I think I am the finished article, then it’s time to give up! I see so many kinds of personalities during my wedding career from the barking mad to the painfully shy and I love them all, even the grumpy ones. 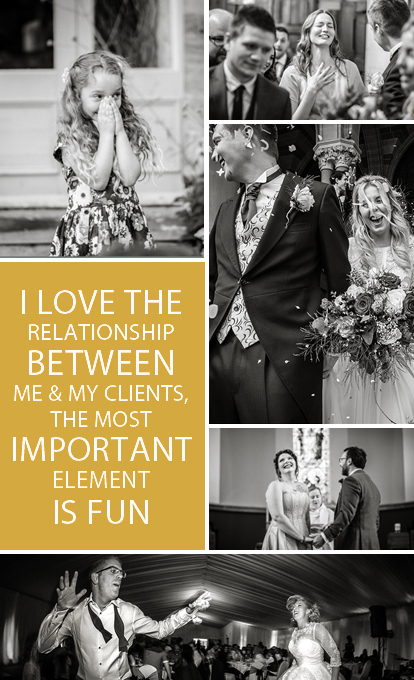 If I wasn’t a wedding photographer I would love to see myself as a psychologist as I find people’s minds intriguing with all the different backgrounds and cultures, but this may be because I’m nosey too. 1. To have a sustainable business that allows me to grow as a photographer, and create works of art for my clients. 2. To have bloody good fun achieving the above.